TENNESSEE FIREBALL: Space rocks have landed in Tennessee. That's the conclusion of researchers who recorded a brilliant fireball streaking over the Smoky Mountain state on Wednesday evening. Bill Cooke of NASA's Meteoroid Environment Office reports: "On April 6th at 8:21:57 CDT, NASA all-sky meteor cameras detected a very bright fireball moving north across the state of Tennessee. First detected 52 miles above the Arnold Air Force base near Tullahoma, the meteor was brighter than crescent Moon and was approximately 2 feet in diameter, with a weight of 200 lbs. It was last recorded 30 miles above the town of Woodbury, Tennessee, moving at a speed of approximately 9 miles per second (32,400 mph)." Tonight while driving home from work I saw an amazing display in the sky overhead. I have lived in Interior Alaska most of my life. I have seen the Aurora many many times... I have seen green ones (95% of the time it is green). I have seen pink ones. I have seen blue ones. I have seen purple ones. There are some beautiful ones on spaceweather.com but they're huge. For photo and more info, click on the above link. I remember seeing a lot more auroras when I was a kid. Yet, when I was a kid I lived out in the country, far from any light pollution and with a clear view of the northern sky. None, of which, I have today. "Don't it always seem to go that you don't know what you've got till it's gone..."
Thank you sansseed for reminding me that I take the Aurora displays for granted because I see them all the time... there are so many people in the world who do not have the opportunity to see it as often as I do... like that German guy I rang up at the liquor store. He said he came all the way here just to see the Aurora. Of course an idiotic young man came into the door and interrupted our conversation (we were speaking in German) by marching up to the counter and shouting, "ACHTUNG!" right into my face. Dummkopf. It often has a "rippling" effect, much like a writhing snake... but very slow most of the time. It will fade, then start back up again in a different part of the sky. You never know when or where to expect to see it. The aurora is best seen when it's very cold... like -30 or colder, because when it's that cold there aren't any clouds in the sky because the air is too dense to form clouds. It's also best seen in rural areas away from bight city or traffic lights... like out where I live at the moment. Anyhow, she told me she always wanted to see the Northern Lights. One night, it was about midnight, I went outside for a cigarette and saw a green glow in the sky. I ran back into the apartment and shouted, "THE LIGHTS ARE OUT! THE LIGHTS ARE OUT!" Of course, my roommate from Valdez and her girlfriend knew what I was talking about because we're all Alaskans. We banged on the Colorado girl's bedroom door shouting "THE LIGHTS ARE OUT! COME OUT AND SEE!" She shouted back, "I don't care! I'm sleeping! It's just a power outage... God you guys!" I stared at the door, processing what she had said for about three seconds. Then both my other roommate and I said in unison, "The NORTHERN lights are out!!" I have never heard the term carrot sprite..
Me neither until Steve wrote about it. I wonder what other weird things are going on here on Earth that we don't know about? Maybe there are broccoli sprites and tomato sprites also. Yesterday, the world was abuzz over a massive solar flare that was more like a solar explosion than anything else. With the videos of the blast hitting many non-space news websites, all eyes were on the Sun, or at least videos of it. In fact, Spaceweather.com, one of the web's premier astronomy websites, actually crashed because of too many visitors. Now, after the buzz has subsided a bit, Spaceweather is back up again and the webmaster, Dr. Tony Phillips, has announced that the hardware behind the website has been upgraded to handle increased traffic. So, how's the space weather looking for today? 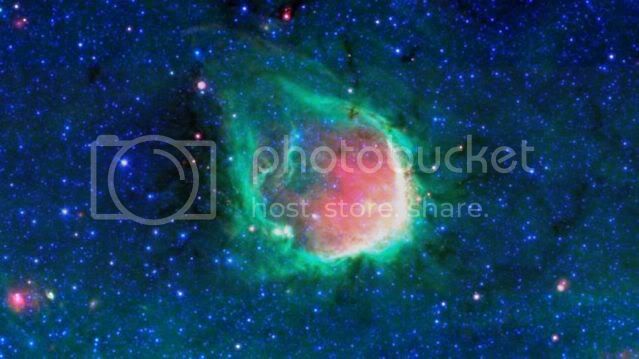 This glowing green nebula gets its ring-like shape from the powerful light of the most massive stars known to exist. The ten light-year-wide nebula, named RCW 120 and imaged by NASA’s Spitzer Space Telescope, is found in clouds of dust and gas near the tail of the constellation Scorpius. It lies slightly above the flat plane of our galaxy, the hazy glow of which can be seen towards the picture’s bottom. To human eyes the ring of glowing dust is invisible, but it shines in the infrared wavelengths Spitzer sees. Blue represents 3.6-micrometer light, green is 8 micrometers, and red is 24-micrometer light. The ring is sculpted by a pair of giant “O-type” stars that lie at the ring’s center, blowing bubbles with the pressure of intense ultraviolet light. Class O stars are very hot and extremely luminous, being bluish in color; in fact, most of their output is in the ultraviolet range. These are the rarest of all main sequence stars. About 1 in 3,000,000 of the main sequence stars in the solar neighborhood are Class O stars. Some of the most massive stars lie within this spectral class. Type-O stars are so hot as to have complicated surroundings which make measurement of their spectra difficult. O-stars shine with a power over a million times our Sun's output. Because they are so massive, class O stars have very hot cores, thus burn through their hydrogen fuel very quickly, and so are the first stars to leave the main sequence. Recent observations by the Spitzer Space Telescope indicate that planetary formation does not occur around other stars in the vicinity of an O class star due to the photo-evaporation effect. Spitzer observations have found that many of the Milky Way’s O-type stars blow similar bubbles of glowing gas. The small objects at this image’s right may be similar rings seen at much greater distances across the galaxy. My brother big Mike ( Mike stands over 6 ft 6 inches high - so we always called him big Mike) is visiting me for a few weeks as his teaching job is on summer break. The other day while I was reading on my deck Big Mike decided to spend some time working on my pool filter. We talked for a short time but mainly I read and he worked. The sky was beautiful. It was like the skies I remembered from my childhood. Crystal clear and very blue with huge puffy high clouds drifting slowly over a perfect summers day. "Look at that f cloud in the oval ring shape. What is going on there?" I put down my book and stood up so I could follow his pointed finger . He was pointing to a cloud that was much lower than the others. It was a oval white cloud with the center less formed and a bit see through allowing some blue sky to peek through the center. At first glance it seemed perfectly normal. I watched it for a few seconds and immediately realized it was far from normal in fact it was extremely odd. The shapes of clouds and other natural phenomena have long been a device for interpretation of future events, the reflection on our past, and even indicated the deeper meaning behind the things connected to them. Images of Jesus and other figures from history and mythology have been appearing in objects, and even the clouds themselves are not an exception. But when a towering face took over the horizon in one man's neighborhood he was speechless. And what's perhaps even more interesting is just how the face materialized - as if it were pushing out from the clouds to look down at the city sprawling out in front of it. The face was unlike so many others like it very distinct and almost photorealistic in its appearance. The image was far from anything that we are used to seeing in the sky. In fact, the face was so distinct, that sideburns leading up to mutton-chops at the lower side of the face could be clearly distinguished. A photograph of a person could hardly have been more detailed or convincing when it came to the distinctness of what this face looked like. And when it comes to strange weather formations, don't expect things to slow down any time soon. The weather will be ramping up significantly now after a series of solar flares were released this week. But even in the climate of doom and gloom these clouds can serve to be a bit of a distraction even if it's not directly paranormal in itself. Or is it? In the great scale of the universe humanity has been trained to recognize patterns like the fibanacci sequence which will appear at the smallest levels of nature and then the largest as well. What if there are other patterns, such as the human face which naturally appear in very recognizable ways all the way up to the greatest levels of the cosmos? Perhaps we are actually living as a speck of dust in the eye of a great trans-galactic bearded face. And if that face were to be seen from a sufficient distance, how do we know we wouldn't recognize it as something almost photographically recognizable? Looks like George Washingtons profile. Like on the quarter to me but facing the opposite direction. I just experience something strange my self in the sky not more than two hours ago. I tried to send Sky the two videos but they are too long to load on mailbox. Darn.. strange I come on the forum and see this right off. Looks like George Washingtons profile. Like on the quarter to me but facing the opposite direction. Yup, that's Lubbock all right. I went to school there for several years and duststorms like that are pretty common. The land up there is as flat as a stack of flapjacks and the wind blows incessantly. There are miles and miles of cotton farms up there and in the spring and fall after they harvest the cotton there is just bare earth that gets carried off by the wind very easily. Especially during a dry year like we had recently. Once I went out of town for the weekend and accidentally left one of my windows open just a crack. When I came back everything in my apartment was brown from all the dust. If the devil went down to Georgia this week, he must have traded in his fiddle for blood-red auroras. A cloud of charged particles from the sun slammed into Earth Monday, setting off an intense geomagnetic storm that spawned northern lights across the U.S.—even in the Deep South. Sky shows were reported in more than half the 50 states, including Georgia, Alabama, and Arkansas, according to Spaceweather.com. The northern lights seem to create a big red spot amid a sky full of green auroras in a picture taken very early Tuesday from Marquette, Michigan (map). The sun has been ramping up its activity over the past year, heading toward the next maximum in its roughly 11-year cycle. The star-spangled sky over Kansas is interrupted by a rare auroral glow in a fisheye picture taken Monday night. The northern lights weren't visible to the naked eye, according to photographer Jim Hammer. But the sky show came alive in long-exposure pictures, like this one snapped about 10 miles (16 kilometers) north of Wichita (map). The sun is about to blast us with some x-class solar flares...look out electronics! There is an enormous sunspot building. Each of the primary dark cores is about the size of Earth, and the entire group sprawls more than 100,000 km from end to end. The sunspot is so big, it's starting to attact the attention of people looking into the sunset. The aurora was out last night while I was driving home... it wasn't anything spectacular though.... just your usual run-of-the-mill green haze.